Intermodulator is a sound responsive installation that produces diverse patterns of moire image through participants’ collective and improvisational sound engagement. The system receives and analyzes the frequency and volume of different live sounds, and map them to the speed of the fans and the brightness of the backlight. Current installation is comprised of eight different modules of the fans, and each module is assembled by two fans that oppositely face to each other like a sandwich (Figure 2). 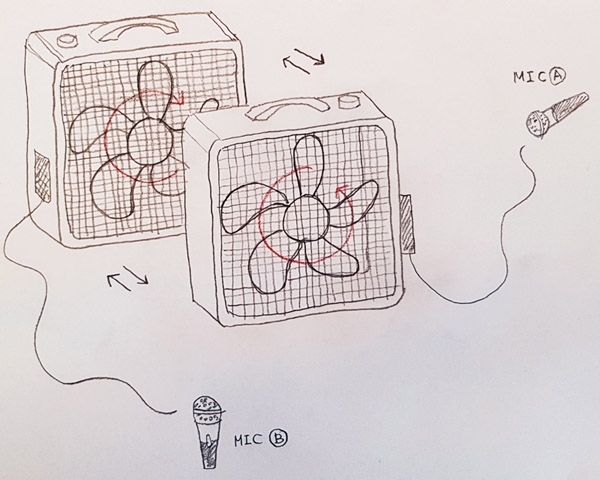 Each side of fans is connected to two different sound inputs (mic A and B in Figure 1, 2), and this module assembled with an incandescent light bulb produces diverse combinations of fan images by responding to participants’ sound (or music) engagements. When a certain resonance and tension are achieved between these different inputs, the installation produces diverse patterns of moire, which is visionary illusion caused by mutual ‘interference’ of two oppositely rotating objects or visual images. Figure 2: One module of Intermodulator responding to two different sound inputs. The speeds of individual fan are mutually affected by each other’s sound. Like a seesaw, which requires more than one person to appropriately enjoy it, its design of the system naturally and implicitly encourages people to use this installation in a collaborative format. 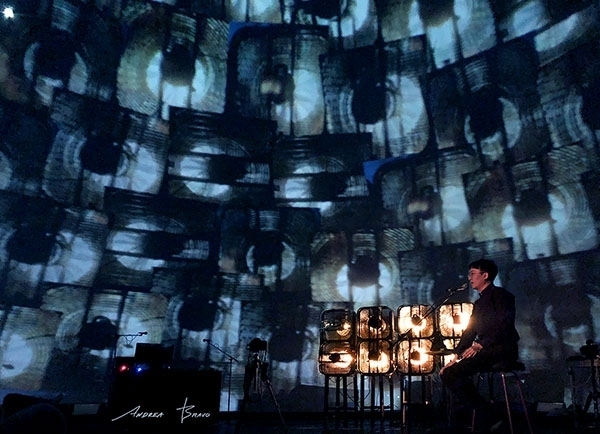 This system also can be extended to multi-channel inputs by incorporating an audio-mixer through which more than two people can interact with the installation.The following videos show its alternative version where eight participants collectively improvise with the installation. 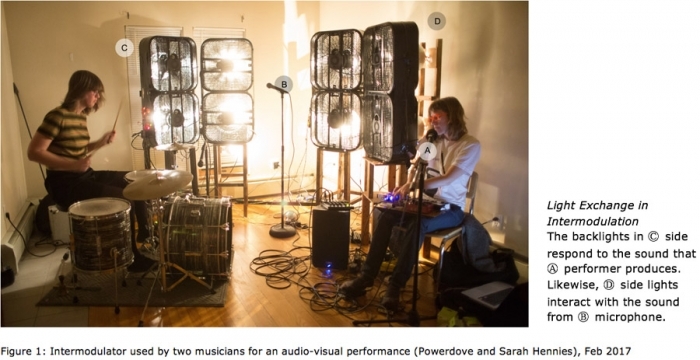 By providing a heuristic space where participants can produce interesting audio-visual performances through collaborative improvisation, this installation allow people to empirically explore the nature of collaboration and improvisation that promotes group creativity and learning. The system of this installation is built by assembling diverse DIY electronic components. The PSSR/ZC Tail has been used for safe control of 120vac incandescent bulbs through zero-crossing detection. For analyzing the frequency and level of individual input sounds, Sparkfun’s Spectrum Shield has been used. The speed dials in the box fans have been hacked and connected to four channel relay shields. These electronic components are connected to and controlled by the Arduino-based microcomputers. More than 2000W at 120VAC is required to run the whole installation.